The team behind the upcoming mission have recommended a landing spot on the red planet called Oxia Planum where it is believed a large pool of water sat billion of years ago. Teams from the European Space Agency (ESA) and Russia’s Roscosmos will confirm the site in mid-2019 ahead of the much-anticipated launch scheduled for the following year. 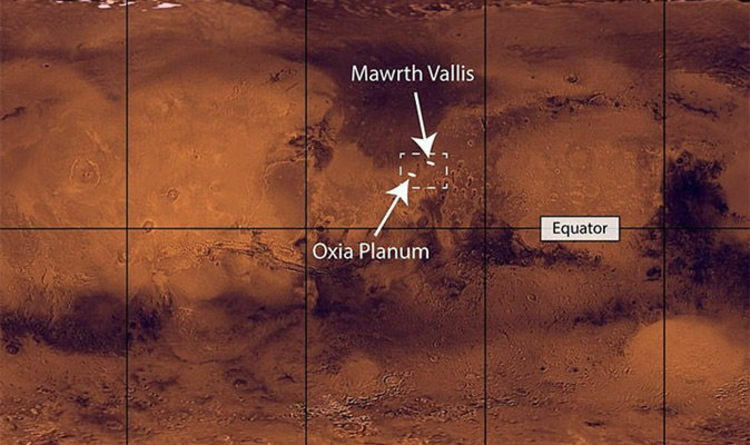 Oxia Planum is one of two sites researchers have been considering, with Mawrth Vallis - a valley on Mars - revealed as the other. The mission will see an ESA-Roscosmos ExoMars rover reach the selected site to take samples for ground-breaking studies. Both sites are rich with evidence of Mars’ watery past and sit north of the planet’s equator. ESA’s ExoMars 2020 project scientist Jorge Vago said: “With ExoMars we are on a quest to find biosignatures. “While both sites offer valuable scientific opportunities to explore ancient water-rich environments that could have been colonised by microorganisms, Oxia Planum received the majority of votes. The ExoMars Trace Gas Orbiter has already been busy hunting for signs of Mars’ biological activity. Researchers recently gathered at the UK’s National Space Centre in Leicester for a two-day summit to discuss the two sites. Experts established Oxia Planum was the better site option as it sits on what was once an ancient body of water that numerous streams drained into, and as a result is home to layers of clay-rich minerals. The mission is scheduled to run between July 25 and August 13 in 2020, with the main goal to find out whether there was ever life on Mars.